Current release of OpenWith macro is: 1.2-3. 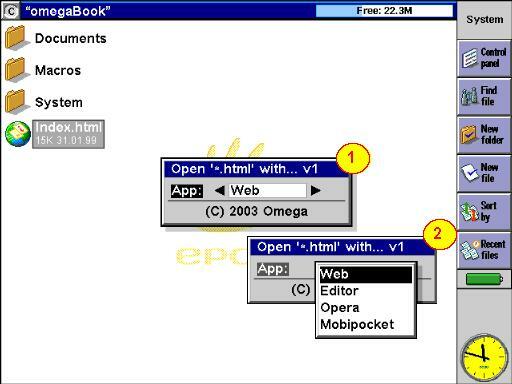 All Psion machines with EPOC OS and installed Macro5 application. OpenWith is inspired by psiLoc's plOpenWith. Basically OpenWith allows you to associate different applications to different filetypes. Even you can have more applications associated for one filetype or folder. Actually you can use OpenWith for managing: RAR(emxunrar), ARJ(emxunarj), ZIP(emxzip,emxunzip), LHA(emxlha), ACE(emxunace), TAR(emxtar), GZ(emxgzip), BZ2(emxbzip), SIS(emxsis) archive files. You can download OpenWith distribution with binaries and sources from: Patisoners-Psion-macros download section. Activate OpenWith on selected file in system shell by pressing FN+SHIFT+ENTER. OpenWith will search in database for file extension. In case that extension was found, OpenWith will ask you to chose appropriate application (if more than one application) to open the file (see picture 1, 2 below). If application's extension is not in the database, OpenWith will search in "any file extension" applications. These applications are configured in the database with extension name * (multiply sign). OpenWith database is stored in EPOC Data format in standard Macro folder. See example database for more details. For example you want to open a html file in Editor and make some changes in content. Normally, you need to start Editor and open it from here. OpenWith allows you to open it directly from shell. You also can install more web browsers and select in which to open the file. Another example is to use this macro to open selected file with FileDump to explore the contents, pack it with emx's ZIP, GZIP, TAR...etc.. You can configure this macro to compress whole folders, decompress files, play music, view pictures... anything! You can study attached openwith database where are most cases covered. Example screen to pack selected file with GZIP (move to archive). Of course you can configure the macro to decompress files with extension GZ. Each row in database is one OpenWith file extension rule. Any folder is set of tools applied on the folder. You can ZIP whole folder for example. Order - order in which the application will appear in OpenWith dialog. The most favourite application should have number 1. 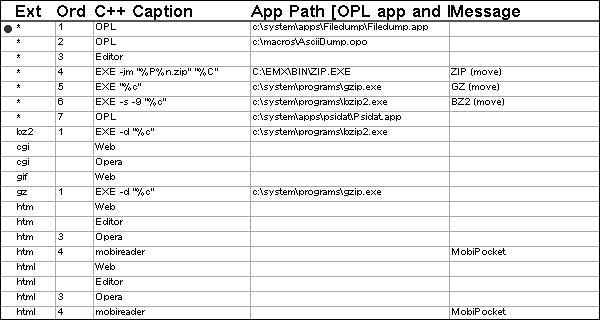 Full path of APP file in case that application is written in OPL or full path of EXE file. Your own name of current operation. For example Move to archive, play SID...etc. If you leave this field blank, OpenWith will try to guess the name from AppPath or C++ caption. More examples you can find in EPOC database file OpenWith.db or in plain text file OpenWith.csv. Any bugs, recommendations, feedback send to osg at atlas dot cz or use "Contact us" in Main Menu.